Don't keep this great resource to yourself! Please share it with your colleagues and networks. Cultural competency helps protect racial, social, and linguistic communities from being disproportionately affected by emergencies. Join CDC’s Emergency Partners Information Connection and Julio Dicent Taillepierre from CDC’s Office of Minority Health and Health Equity for a discussion on why cultural competency matters during emergencies, the potential consequences of being culturally incompetent, and resources to help build your understanding. The webinar will be held on April 24 at 1 PM ET. The National Association of County and City Health Officials has created a toolkit to support local opioid overdose prevention and response efforts. CDC’s RX Awareness website provides opioid overdose prevention, treatment, and recovery resources. For over 25 years, the Hispanic Federation has worked to empower and advance the Hispanic community. We work closely with Latino health and human services institutions to promote the social, political, and economic well-being of the Latino community. Our seven strategic action areas include education, health, economic empowerment, immigration, civic engagement, the environment, and organizational development assistance. The Hispanic Federation delivers food in Puerto Rico after Hurricane Maria. What is the role of your organization in a public health emergency? During a public health emergency, we coordinate with local health departments to implement measures to control the outbreak, link communities to resources, use our hotline and radio programming to inform the public about the health emergency, mobilize our member organizations for support, and advocate for urgent public health policy improvements. How do you plan for emergencies? During emergencies, news and information is key. While we can never predict the severity of a health, environmental, or social emergency, we have communication and response plans in place so that we can be as prepared as possible. The key parts of our plans include tapping into an expansive collaboration and communication network, and mobilizing people on the ground. Additionally, our offices conduct emergency drills every 6 months. The majority of our staff has adult and pediatric first-aid, CPR, and AED certification. Our staff also has safety and security training, including active shooter response. What is one experience or lesson-learned that you have from an emergency response? One of the most devastating natural disasters of our lifetime was Hurricane Maria. There was no way to prepare for the resulting loss of life across Puerto Rico. What helped us most was establishing relationships with our dedicated partners on the ground. We were then able to create our own routes and processes to immediately serve the communities in need. Through long-standing relationships that built credibility and trust, we were able to work better together for a stronger and more effective emergency response. It is what made our UNIDOS Disaster Relief and Recovery Program so effective in serving the immediate and long-term needs of families and communities across the island. 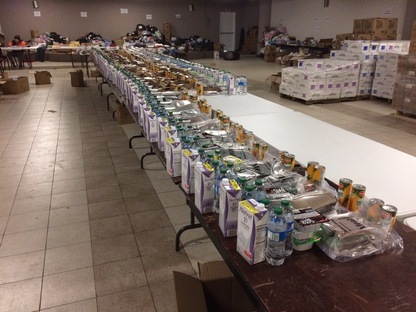 We also helped coordinate hundreds of donation drives in the mainland U.S. Tapping into the energy and wealth of U.S. immigrant communities, we distributed millions of pounds of food, water, and other essentials to those most affected by the storm. We delivered emergency relief aid to the 78 hard-hit municipalities and provided $30 million to support emergency relief and recovery projects throughout Puerto Rico. What is one piece of advice that you would give to other EPIC partners? While you can never predict the next health crisis, having credible partners with an expansive reach into the communities you serve will increase your odds of success. Keep people first. During an emergency response, centering efforts on the people in crisis keeps you focused on the larger goal while pushing through the difficulties and obstacles ahead of you. It also reminds you of the fundamental right to human dignity each person has, especially during a crisis.